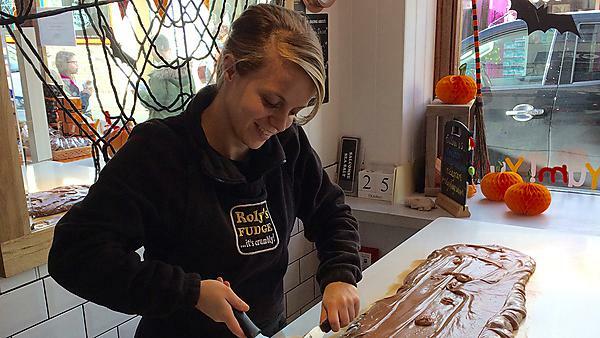 Shortly after I completed my studies, I was offered a full-time job as a store manager at Roly’s Fudge Pantry. I had already been working in the Plymouth store whilst at university; however, this was a very exciting step for me. I started the job just before the busiest time of the year and this was a great way for me to get into it and learn whilst working. Before the end of university I was unsure of my career path, but once I left everything fell into place and now I am in a job that I thoroughly enjoy. The most difficult aspect for me was juggling all the different tasks that I needed to perform on a daily basis within working hours. It took a while to get used to it as I have never had this kind of responsibility before, but it is now very natural to me. Making fudge, which is something that I do on a daily basis and is the essence of my job, is still is just as exciting as the first time I made it. It is different every time it’s made and is something that I can feel proud of when finished. The only aspect that I would change about my job is the commute. I currently still live in Plymouth, and it is a two hour round trip to work each day which leads to long days. Regardless of this, for me, it is still worth it. The best advice I can give is to get a part-time job in a sector you are interested in whilst you are still studying. You never know where it can lead and even if you decide not to continue down that route it gives you workplace skills that are invaluable, especially nowadays. Plymouth gave me the flexibility and range of subjects to allow me to find something that I was interested in. It gave me the basic knowledge that I needed to apply and develop when I first began my job. A favourite and very memorable moment was the completion of my dissertation. Dissertations are a huge piece of university and take a lot of time and effort, but the unity that it encourages in people is amazing. In the last few weeks before the deadline I saw people helping one another, even though they had so much left to do with their own work. The feeling when you hand that paper in is one you will never forget: a sense of achievement and relief. Yes, I am still in contact with many Plymouth University students. Due to the fact that I am still in this area I regularly see and socialise with them and catch up on how they have progressed since university. Plymouth University is a very open minded university and provides as much as it can for its students. The courses are very broad, which is a great starting point; you can specialise courses by selection later on, which tailors the course to you as you recognise which direction you would like to take. Always keep any open mind when thinking about your future career path; there are so many opportunities available, pursue as many as you can. Find a job that you enjoy, not that pays the most. Did you win any awards or prizes while at university? Yes, I was lucky enough to be awarded The Devon and Cornwall Business Council Prize for the Best Business Management Graduate. I never believed I had it in me to even get a First Class Honours, but once I knew that I was on track for one and I started to believe in myself and aimed my sights a little higher, I wanted to get the highest in the year. This is something that I never believed I could reach, so I was surprised when I received an email saying that I would be awarded one at graduation. My family were so proud of me and the recognition really made the hundreds of hours of work and the whole university experience worth it. What attracted you to working in the South West? The South West, in my opinion, is one of the most beautiful places in the UK and is very much underrated. The location where I work, Salcombe, is somewhere that people come to visit on holiday, so I feel very lucky that I am able to work and live nearby.